Wow! Two months of 2013 have disappeared already. And it’s been busier than ever. What can I tell you about my work at the library so far this year? We installed new movable shelving for our non-fiction collection in our main branch which entailed a team effort of unloading, loading, reloading, unloading, reloading books by hand. But the end result is very pleasing and we have just ordered the display fittings that go along with this new configuration. The plan is to rearrange the non-fiction books from Dewey to shop-style subject categories. Then we will need to get some new signage to suit. We have also embarked on the RFID implementation. At present we have completed one small branch and almost finished the second small branch. Then it is just the tagging at the main branch to go. Another team effort is required to get this job done, and everyone is stepping up to the plate. This new technology will allow customers to check out their own items giving them more privacy and independency. It will also free up our staff so they can provide some deeper and more meaningful conversations with the customers. I have completed and passed two subjects for the Master of Information Studies and have just two to go. I have started Social Networking for Information Professionals. Next weekend is a long weekend here in Victoria and I will be going along to the Annual Port Fairy Folk Festival for the fourth year in a row. Last year I had the pleasure of seeing a band called Tinpan Orange and just love their song Every Single Day. My youngest son was married last month and that was a fun event despite my mother passing away the week before and her not being there (in body) with us all. The Tomorrow’s Library discussions continue. 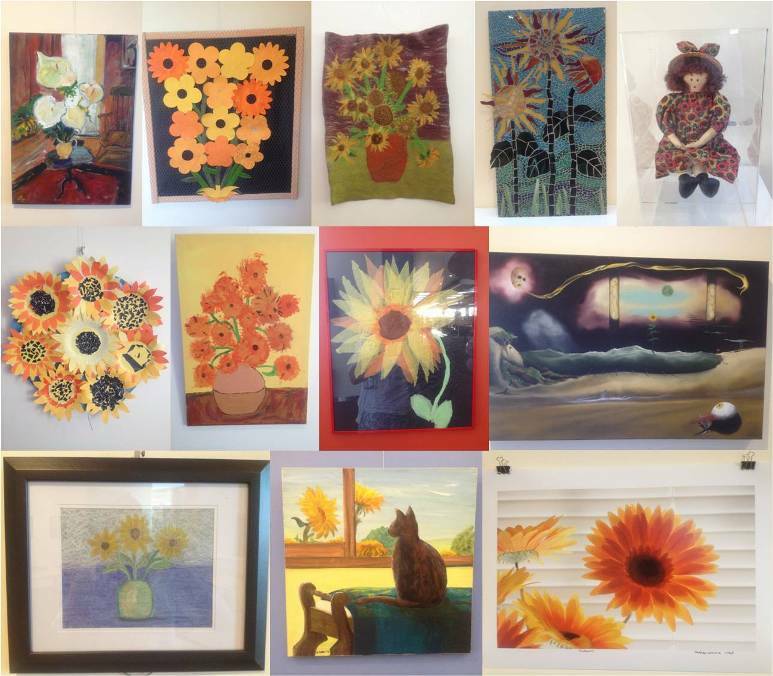 Our current open art exhibition is ‘Sunflowers” and we have received many bright works of art from local people. It is always such a privilege to receive and hang these creative pieces. I totally love the idea of inclusive community art, because after all we are all creative to some extent. Yesterday (on a Sunday) I attended a workshop Social Media for Small Business and the Arts presented by John Paul Fischbach and Criag Lambie of Auspicious Arts Incubators. It was a really worthwhile session and these guys really know their stuff. I got a lot out of it and wrote my notes to Twitter until my phone battery went dead. It really gives me a better perspective for revamping the social media presence of our library. I am currently reading Wild: from lost to found on the Pacific Crest Trail by Cheryl Strayed (this is my favourite genre – true travel stories with a twist or quest) and Face2Face by David Lee King. I am listening to Little Stories by Harry James Angus and podcasts of the Midday Interview with Margaret Throsby and This is Your Life by Michael Hyatt. This entry was posted in Uncategorized and tagged art, libraries, movable shelving, non fiction books, port fairy folk, port fairy folk festival, public libraries, RF, RFID, social media, social networking by suesbent. Bookmark the permalink.